"Better Proposals will make you money!!!" This is hands down the best proposal solution I've ever used. It takes a bit to get your bearings but once you're comfortable you can whip up awesome and engaging proposals, send them out, track interactions with them, and edit on the fly. Great product! Even better is the customer support - they are super fast to get back and even faster in making fixes when necessary. I was totally blown away that I sent a request before going to bed and the fix was in by the time I woke up. Amazing. I'd like to see a dedicated contract section for the proposals. It would also be cool if you could add places where the client needed to initial certain points before the final signing. Closing sales with new clients, expediting the process of getting contracts signed, editing proposals on the fly after they've been sent. "Fast way to send out proposals electronically"
Speed - I can go from a consultation with a prospect to sending them a proposal in minutes. Whilst I haven't tried it, I would be happy to build a proposal in front of a prospect, showing them complete transparency. The pricing tables don't accommodate hourly rates and estimates. The language used in this section is fixed so I can't use it, but there are ways around it. Don't just limit yourself to proposals. I use this product for terms and conditions and anything that needs a client's signature. I know when the client has seen it and it's easy for them to respond. I've struggled to get printed terms returned to me - it's easy to forget that many business owners work from their phone or tablet, so having an electronic solution just makes sense. "Close more proposals and get paid faster"
It's really easy to set up a proposal, as they have templates (always adding more) and the editor interface is very intuitive and simple. Nothing, really. But they could implement auto-responders or something similar to automate follow-ups and all that. Give it a shot, it will save you time, and earn you a lot of money. It will pay for itself in no time. You will be able to close clients a lot faster, avoiding meetings to answer repetitive questions, cutting down infinite email chains to discuss the proposed terms (what's included and what's not, timeline, etc) and you can get pay directly from it, so you close and get the money at the same time. It's white label too, so it's perfect for any business. I can sell digital services a lot faster, as the templates let you provide a lot of information in a simple, yet deep way. It's very visual and easy to navigate, so even the non-techie clients will be able to understand all that you can offer to them. Also, you can implement a live chat widget, so you can solve any questions in the moment, and that's priceless. Say goodbye to 1000 emails about the same topic. "Powerful proposal creating software with multiple valuable extra features"
- I love the detailed templates that can be used, and how easy it is to edit it. - The ability to create custom proposals and save it as templates. - Creating a library of different parts that will be used in proposals. - Stripe integration for immediate payment. - Amazing personal customer support! - This is cloud-based, and if your internet disconnect, be aware and beware - you might lose your work. Having segments of proposals in the library will actually save you from disaster in the future. Be sure to start saving segments of your proposal in your library to speed up creation in the future. Before Better Proposals, I used Google Docs for proposals, but it wasn't near as professional looking. Now I can create top notch proposals and track the customer interaction with my proposal. "A great way to send proposals"
Printing can be a bit odd in the layout. Not major flaw. Trust the templates, they are a great guide. Also the way the proposals are structured. It just works. The ability to send long form details of the value i will bring to my clients. Im solving the problem of not closing enough sales. Now with Better Proposals i close more deals. What i like best is the wow factor of sending a proposal through my own link and my own email domain. It truly gives a great impresion in my prospects mind. Nothing like entering the battle with the negotiation terms in your favor. Better Proposals pays for itself every month. Its an invaluable asset to my sales department. I can say without a doubt that the Better Proposals team are headed in the right directon. Cant wait to see what they will come up with next. The service is great. Im very happy with them . Support tickets does not go over a day without an answer. And the team even review and critique your proposals so you have better chances of success. The level of attention is amazing. As the pace this company is disrupting the proposals space. Thank you from a very glad User. Hope you stay around for the many years to come. Not only is better proposals easy to use, it creates STUNNING proposals. Saves times and helps close deals... nothing is better than that! I would like to be able to download an entire template into the content library. Don't hesitate, just get it! We were having trouble taking clients from proposal to signing the contract. It felt like too many steps. With better proposals the sales prossess is easier for both the client and our team. "Better Proposals lives up to its name"
The interface is easy to use and there are samples to guide you. Adam is accessible and has some great advice. I love the tracking feature... no more waiting around to see if they received or viewed the proposal. Yay! I'm very satisfied with the service. Adam is upgrading and enhancing features all the time. I highly recommend you give it a try. Talk with Adam if you have questions. I can get proposals out much quicker than before and they look great. "Nice way to stand out from other proposals"
Better Proposals is a super easy platform to send proposals. It gives it a very Modern touch by giving it a website flow feel to it. It definitely stands out from the rest. They also give you good templates to work off from. I dislike the fact you cant add multiple pricing tables within a single proposal. I also dislike the cancelation process. Give it a try they do have a trial period and play around with it.It definitely has the cool factor. The way we send out proposals on the fly. befgore we would send out via word doc and with better proposals it looks much more professional and its kind of fun oddly enough. "This company and software is seriously so amazing." not much... maybe that you have to pay for it? but its soo worth it 1000% saves me tons of time and effort, and helps me win proposals and make money. "Great product that wins more deals in less time!" More than anything, the customer service is incredible. Sabrina is like a friend that genuinely cares about how well I do! You cannot ask for more. Amazing!! I also love that it's an actual webpage that I integrated with my chat account. If a prospect has a question they don't have to wait until our next conversation or write it down or assume the wrong answer, they just click on chat and ask me! Not much. With the templates, it's easy to get setup and start sending proposals not only faster, but proposals that truly stand out! "Great system that gets better"
Automates an arduous process. Flexible. Instantaneous customer service. Constant upgrading. There is not too much that I dislike. Anything I do dislike, one by one they are cleaning up. Worth it. Build a library of snippets you can use with all proposals. My business is all about scalability. I have signed 15 clients in a little over 60 days. Ten fo them have received a Better Proposal. 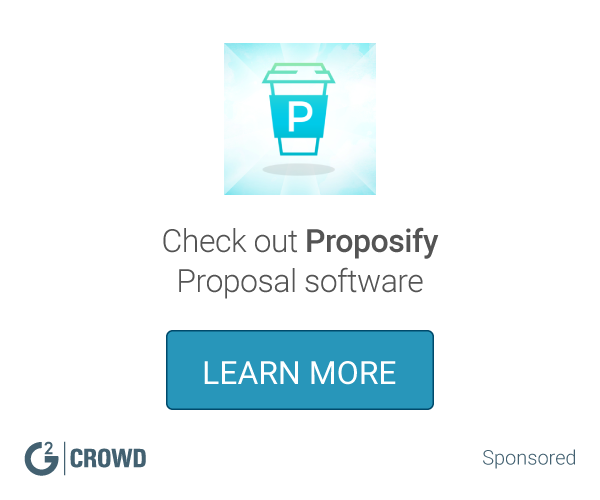 I’ve tried all the different options for proposal software and this is the best. It’s clear, clean, and easy to create new proposals. It also offers a ton of info about what people view on each proposal, live viewing and how much time they spend on each section. It integrates well and has all the bells and whistles. Highly recommend. I’d like to customize it a bit more but admittedly haven’t spent enough time with it to figure out how to make the visuals a bit better. It makes writing proposals quicker and repeatable, and it has helped us create a process around proposals where it was significantly manual before. We love being able to send out proposals quickly and being able to track them. Clients can view the proposal on any device and it looks great! Not enough proposals in the free version, so we upgraded. "Fast Software with Fast Support!" Editor is a bit bare bones would like more customization options. Saved me massive amounts of time creating Proposals from scratch. Proposals help to look very professional and inspire confidence in my services. "We get raves about our proposals now as well as our products and services"
Built in templates, simple format, ability to dive straight in and product great looking proposals off the bat. The PDF print option was a bit messy to start but they have been constantly improving that and it is better every release. I have nothing else to dislike. We are trying to prove that supplying ICT solutions and services to Government can be simple, cost effective and easy. Better Proposals allows us to ensure we are able to be consistently awesome at all stages our journey with clients, clear, smart and easy to understand (not to mention great looking) proposals set the tone for the rest of our relationships. "Works better then I thought"
Wish I could integrate payment for Waveapps. Customization of beautiful, online proposals that are easy to read and follow. Better Proposals allows me to create an index that makes it easy for clients to navigate. My FAVORITE thing is that I can see when a proposal is opened, downloaded and signed, allowing me to move the clients into a smaller sales funnel. The professional designed proposals. Easy to setup and custom branding. So far I haven't encountered something that i dislikes. Presenting my business more professionally. Improved closing rate. It has a nice layout . It is asking me to fit 40 characters but there isn’t much good to say. They had a major crash and did nothing to fix it. There is a lot of crashing in general and a lot recently with their server crash. They have terrible customer service. I have emails to verify this information. Check their recent reviews. It was good at first then glitches and crashing. They didn’t fix the problem. "Faster, more attractive, more impressive proposals." In my sector the simple fact that a proposal is good looking is a differentiator. The fact that Better Proposals allows us to create great looking proposals and have them online too is fantastic. We can move faster and produce better looking content. My industry still likes to print things off, archive PDFs into project folders, etc. The PDF export could be better, although I understand this might be difficult without compromising the main online product. Hopefully my industry will catch up. "Very nice and gets us noticed"
* We monitor all Better Proposals reviews to prevent fraudulent reviews and keep review quality high. We do not post reviews by company employees or direct competitors. Validated reviews require the user to submit a screenshot of the product containing their user ID, in order to verify a user is an actual user of the product. Hi there! Are you looking to implement a solution like Better Proposals?